The Karnataka government had passed an ordinance or executive order, to allow it from November last year. New Delhi: The annual buffalo race, Kambala, will continue in Karnataka for now, as the Supreme Court today refused to put it hold and said it will hear the matter in March. 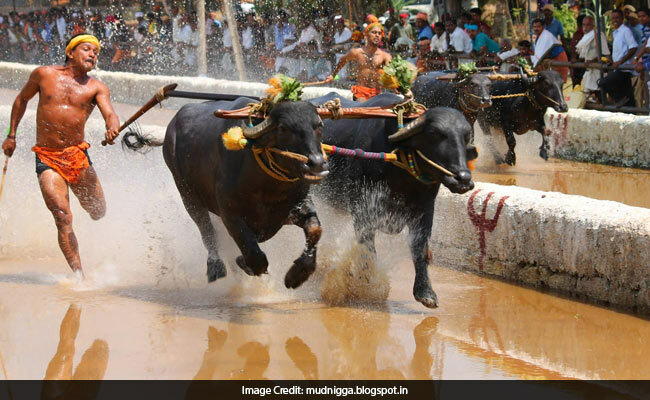 The Kambala festivities start in December and continue till March and coincide with Pongal celebrations which involve buffaloes racing along a muddy stretch, usually tied to a plough and whipped by a man running with them. The bench of Chief Justice Dipak Misra was hearing a plea by the animal welfare group People For Ethical Treatment of Animals or PETA, which is seeking to ban the buffalo race. The court was told that an ordinance backing Kambala, passed by the Karnataka Assembly, has lapsed. When the bench was urged to step in and stop the race, which is scheduled for February 18, Justice Misra said "races will take place next year also". The court will hear the plea to March 12 now. The PETA had earlier approached the Karnataka High Court alleging Kambala involves cruelty to animals. The high court agreed and banned the sport, which led to mass outrage. After that the state government passed an ordinance or executive order, to allow it. The bill was passed soon after neighbouring Tamil Nadu had allowed Jallikattu, the traditional bull-taming sport that had the activists up in arms. The petitioner then challenged the bill in the top court. Earlier, another animal rights' body, Federation of Indian Animal Protection Organisations (FIAPO), had approached the top court challenging the bill to legalise traditional buffalo races in Karnataka.